Scheck Chairman Richard N. Scheck, who serves as Board Trustee of the Youth Scholarship Foundation, celebrated with a number of proud scholarship recipients during the 2015 Annual North Riverside Youth Scholarship Golf Fundraiser on June 8, 2015, at the Riverside Golf Club. 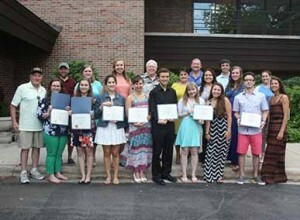 This year, the Village awarded 46 scholarships to deserving youth. Over the 20 years that the Village has administered this scholarship program, it has awarded 786 scholarships totaling $457,750.00.